Don’t wait, this favorite Pacific Beach house sells out!!! 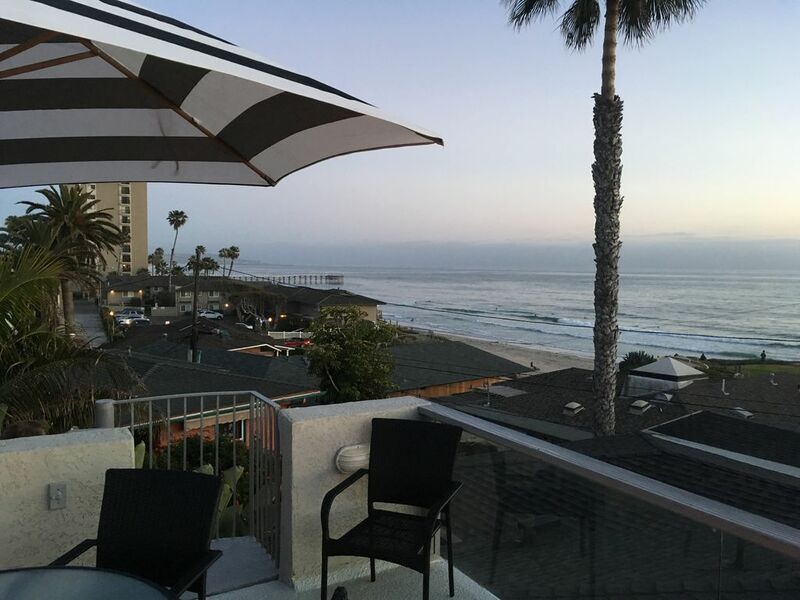 Rent our 3 bed / 2 bath vacation home steps from the beach in North Pacific Beach, San Diego's most desirable beach community, The beach directly out front is a favorite family beach with good surfing and swimming with lifeguards on duty. As a crow flies we are 300 ft from the tide-line. On weekends morning yoga class is held at Paradise Park above the beach that can be practiced on our roof deck privately or join the class on the grass. Nice decor, fully outfitted kitchen, linens and beach gear. Roof deck with 180 degree panoramic ocean views, with a propane fire pit to enjoy sunsets and refreshing ocean breezes and star gazing. A great location for relaxing & entertaining. Enjoy falling asleep to the sound of the waves. Please be advised this home is on a quiet street. Absolutely no loud parties after 10 pm allowed. Hosting celebrations, weddings, reunions & receptions require pre-approval/+fees. Accommodations: 3 queen beds, 3 twins, 1 bath/shower combo, 1 large shower, plus a hot outdoor shower for beach goers, entertainment center and 4 completely private outdoor sundecks. Beach towels, chairs, umbrella, boogie boards and sand toys are provided. The property is in a special quiet location with beautiful tropical landscaping and is cared for by long term locals. Walk along the coastal boardwalk - to many restaurants, bars, boutiques and grocery stores. Public transportation -1 block to bus #30 to La Jolla or downtown. Sleeps 8. Additional rate applies for parties over 4 in low and mid season and over 7 guests in high season. Upstairs unit. Check Availability! We offer daily maid service for and additional $50 per day. We offer a shopping service to have your vacation rental pre-stocked with your favorite food and drinks. We have owned our beach home since 1964 and are happy to share this rare and wonderful location with guests. My mother has long been known as the 'Queen of Hospitality' by her friends and family, it is perfectly fitting to be involved in hospitality with her home. We love the beach and grew up surfing the local break out front. Our view from the roof deck spans from Pt. Loma to Pacific Beach Point and is a fabulous place to relax and enjoy the sun, sunsets or stars. Years ago when my parents parted ways, my single mother of 3 young girls took a big chance and bought this duplex across from the beach in the early '60s. The idea was we would live downstairs and rent out the top floor with the view to help ends meet, which has turned out to be the best idea she ever had. I am a native San Diegan and am thankful for growing up in such an awesome location. It is with great pleasure we are able to share this special location with people that would never have a chance to visit Pacific Beach in such a 'locals spot' sort of way. I have traveled throughout the world and have decorated the beach house with treasures from around the world. The view is wonderful and our fire-pit on the roof-deck makes relaxing up top a treasured moment - very enjoyable. Order dinner to be delivered from some of our local favorite restaurants, Thai, Italian or Mexican and enjoy a memorable roof-top dinner - you will not be disappointed. Beach walks, sunsets, R&R! We offer a shopping service to have your vacation rental pre-stocked with your favorite food and drinks. Some guests think we should say oceanfront because there is just one house in front of ours before the beach. Panoramic 180 degreee ocean view from the roof deck with views of the sand and waves. There is a gas fire pit on the roof deck with 180 degree ocean views. We provide one off street parking place. Comfortable area for relaxing, conversing and enjoying ocean views with media center. We provide basics like sugar, salt, pepper, coffee and condiments on hand. Fantastic place close to the beach with an amazing view! Perfect spot for our annual girl's weekend in California! Very comfortable home, close to the beach, amazing views, especially from the 3rd floor deck- we loved this place! Isabelle was an added bonus and made us feel so welcome. Thank you! We ABSOLUTELY loved this place!! The owner was very friendly. It had amazing views of the ocean from many parts and decks of the house. The rooftop deck was incredible. The owner thought of and provided every convenience needed for a great stay. She even had really nice shampoo, conditioner & body wash available for use. The beds were extremely comfortable and had softest sheets we have ever felt. I want some for my home now. Executives from 5 star hotels should take lessons from Isabelle. I am not kidding....absolutely amazing in every aspect. There is a loft with a bed that my 15 year old daughter thoroughly enjoyed. Isabelle provided games and puzzles for us as a family to enjoy. The house is super close to the ocean, restaurants and shops. The owner provided us with a parking space which was nice when we returned from sight seeing. Lots of room, amazing views and the best location. I am staying here if I ever get back to San Diego. Thank you Isabelle for a wonderful family stay!!! Great location, comfy beds. Fell asleep each night listening to the waves. Great trip!!! Upstairs unit, kitchen well supplied, great location (never been to Pacific Beach before, really liked it), helpful having owner's mom downstairs to give immediate attention/resolution to various issues. With all the fees I felt was pretty expensive. This is our 3rd stay at this VRBO. We love how close it is to the ocean and the miles of boardwalk we can walk on. The owner lives on the first level and is fantastic! She's available to answer any questions we have, suggest places to tour, restaurants to eat at, places to shop, etc. We absolutely love our time there!! My husband and I had a wonderful month-long stay in November. Our daughter and her two young children joined us for our last two weeks. They enjoyed their holiday as much as we did. The location was perfect. The neighborhood was very quiet. The beach was a block walk away and we were within easy walking distance of good restaurants. The rental unit was spacious and very comfortable, with a view of the ocean from the sun room. Last but not least, our host was most welcoming and helpful. We would definitely stay there again if we have the opportunity. We are located in the quiet area of Pacific Beach in San Diego at the north end of a 4 mile boardwalk along the coast. While visiting be sure to go to the San Diego Zoo, Sea World and Legoland. These rates are subject to change depending on party size, etc. Rates are based on 4 guests. Additional guests may incur additional fees.